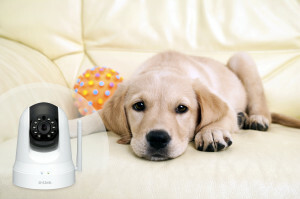 FOUNTAIN VALLEY, Calif. and NEWPORT BEACH, Calif. – March 10, 2015 – D-Link today announced a partnership with Paw Prints in the Sand Animal Rescue, Inc. (PPITS), a non-profit organization dedicated to rescuing, rehabilitating and rehoming abused, abandoned, neglected, and stray companion animals. D-Link will donate Pan & Tilt Wi-Fi Cameras to new pet owners who adopt from Paw Prints in the Sand as part of a larger effort to advocate adopting rescue pets. The relationship will promote responsible pet ownership and pet retention. Additionally, D-Link will develop a series of training and animal behavioral videos in conjunction with Paw Prints in the Sand to help pet owners have happier pets and homes. D-Link® Wi-Fi cameras are an excellent tool to keep up with pets’ activities while away, especially if folks have an in-home pet sitter or daily dog walker – or anyone who has access to their home. Users can view a secure, live feed of their home and pets from a smart phone or laptop from anywhere and enjoy the peace of mind of knowing their furry family members are safe. Paw Prints in the Sand Animal Rescue, Inc. is a 501(c)(3) all- animal rescue organization dedicated to rescuing, rehoming and rehabilitating abused, abandoned, neglected and stray companion animals. Headquartered in Orange County, California, PPITS is an all-volunteer organization committed to placing animals in loving, responsible, committed forever homes. We conduct a comprehensive screening process, which includes taking considerable care in finding good matches and educating prospective adopters about the responsibilities and costs of bringing a pet into their homes and lives. For more information, to make a donation, or to foster or volunteer, please visit http://www.pawprintsinthesand.org. All Donations are 100% tax-deductible. You can also visit PPITS on Facebook and Instagram @ppitsreq and on Twitter @PPITSRescue. D-Link, mydlink and the D-Link logo are trademarks or registered trademarks of D-Link Corporation or its subsidiaries. All other third-party marks mentioned herein may be trademarks of their respective owners. Copyright © 2015 D-Link. All Rights Reserved. Use of audio or video equipment for recording the image of a person without their knowledge and consent is prohibited in certain states or jurisdictions. The end-user assumes all liability for compliance with applicable state, local and federal laws.